East of El Centro. The newly-lined All-American Canal is wide, deep, and swiftly flowing. The Colorado River is the main source of water for the state of Baja California. After the river enters Mexico, an aqueduct starting in Mexicali brings water west for Tijuana and other locales. In the aftermath of the 2010 Baja California earthquake, the aqueduct and other canals were damaged, and for a time Tijuana was in a vulnerable position. 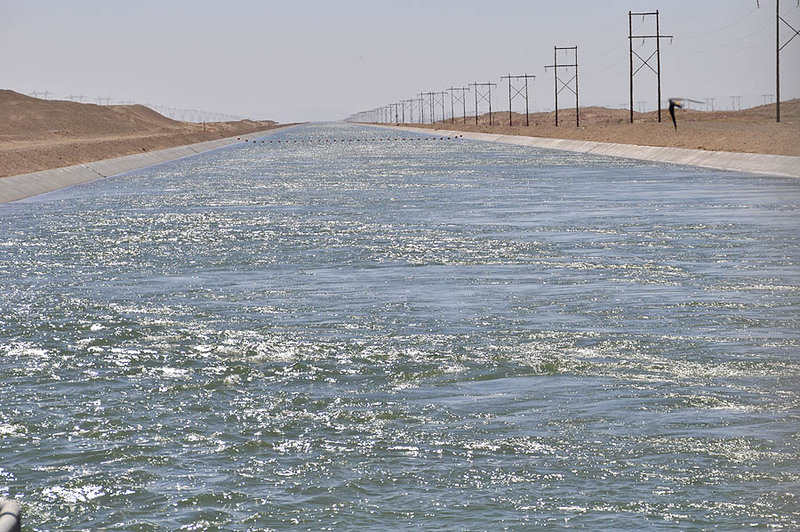 Later, looking for ways to avoid dependence solely on the single aqueduct, Mexico expressed interest in using the All-American Canal to convey some Colorado River water to Mexico during emergencies so as to provide an extra margin of supply reliability. For the next year or so the workgroup will work on design, permitting, and funding. It will also work with the International Boundary and Water Commission (which oversees the 1944 treaty with Mexico regarding water deliveries between the two countries) to determine terms and conditions for implementing the project, and the Bureau of Reclamation which coordinates the Colorado River Basin States’ input to the negotiations. Ms. Razak indicated that the workgroup is looking at a connection with 200 CFS capacity beginning at the western end of the All-American Canal, near the turnout for the Westside Main Canal. If all goes well, it is hoped that construction could be completed in early 2014. Although the City of San Diego isn’t a member of the workgroup, it will have some say in the project because it owns a portion of the capacity rights in the All-American Canal. That’s another story in itself — here’s a fact sheet explaining it. San Diego shoulders some expense in maintaining those capacity rights and will be looking for an agreeable financial outcome should this project be implemented. The April 2010 Baja California earthquake, as many of us are aware, devastated Mexico’s water infrastructure in the region. An Earthquake Engineering Research Institute (EERI) newsletter said an estimated 300 km of canals were knocked out of service [link]. Details on the effects of the earthquake are documented in this EERI Reconnaissance Report. What was the fate of the water heading toward the unusable canals? Would it just be diverted out to sea? As things turned out, however, the temporary storage wasn’t much needed. According to Mark Watton, Chair of the Imported Water Committee, Mexico has been slow to take advantage of that offer because the farmers, not wanting to wait for canal repairs, began digging their own diversion ditches and were able to irrigate their crops. Mr. Watton observed that wasn’t the first time Mexican farmers were able to wrangle some extra water. He said a number of years ago (mid 90s?) the Colorado River had surplus water and about 3 million acre feet (MAF) went to Mexico that year (the U.S. treaty obligation to Mexico is 1.5 MAF). Despite doubling the usual volume of water entering Mexico, Watton recalled, not a single drop made it to the Gulf. Why? The upstream farmers captured and used all the extra water. A short video documenting damaged and then repaired canals and other water conveyance work was also played for the committee. San Diego County Water Authority kindly gave me a copy with permission to post it here (I added the credits at the beginning). This entry was posted on August 1, 2011 at 3:05 am	and is filed under Colorado River, Environment, Videos, Water. Tagged: 2010 Baja California earthquake, All American Canal, El Mayor Cucapah Earthquake. You can follow any responses to this entry through the RSS 2.0 feed. You can leave a response, or trackback from your own site. I guess that, if I read the post correctly, I have some questions about Mexico’s participation in Colorado water. 1) How do the Baja cities/regions of Tecate, TJ and Ensenada get Colorado water? Are there pipelines and PUMPS to push it over the hill? If so, can we Sandieganos (tilde, please) get QSA water via the same route (and bypass MWD)? 2) If Mexican farmers can readily deal with a) extra water, and/or b) damaged infrastructure and still use the water effectively, why do they/we need All American Canal transport and new interconnect equipment? When there is a flood on the Lower Colorado, water makes it to the Gulf of California. However, that does not happen frequently and we can’t keep it flooding every day until there is a permanent solution to the problem. One way to get more water down there is to drain the Salton Sea. Regardless the Salton is dying, and there is legitimately no need for it as it was filled by a canal leak. That way we can take all of the water out of the Salton back into the Lower Colorado and make the former Salton a metropolis. Regardless, this diversion of water plus getting Californian water to be straight from the Pacific, then purified and distributed to cities, which would reduce the amount of water being taken from the Lower Colorado by California, which is a big reason why the river doesn’t reach the Gulf of California all the time.